On the 22nd (Sat), you'll have a packed day of sightseeing: take in the dramatic natural features at Vancouver Seawall and then wander the streets of Granville Island. To find photos, reviews, where to stay, and more tourist information, use the Vancouver online trip builder . Goiania, Brazil to Vancouver is an approximately 23-hour flight. The time zone difference when traveling from Goiania to Vancouver is minus 5 hours. Expect slightly colder temperatures when traveling from Goiania in June; daily highs in Vancouver reach 24°C and lows reach 15°C. You'll set off for Victoria on the 24th (Mon). 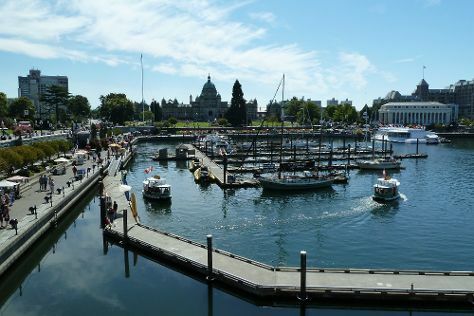 Start off your visit on the 28th (Fri): admire the landmark architecture of Craigdarroch Castle, then contemplate the long history of British Columbia Parliament Buildings, and then explore and take pictures at Inner Harbour. To see traveler tips, more things to do, ratings, and more tourist information, read our Victoria day trip planner. Traveling by flight from Vancouver to Victoria takes an hour. Alternatively, you can ride a ferry; or do a combination of car and ferry. When traveling from Vancouver in June, plan for a bit cooler days and about the same nights in Victoria: temperatures range from 20°C by day to 13°C at night. Finish your sightseeing early on the 28th (Fri) so you can travel back home.